Permanent makeup is becoming one of the most popular makeup choices for people all over the world, and it’s easy to understand why. Think about your daily routine — how much time do you spend on your makeup each day? Here’s something to consider: even if you spend just 15 minutes per day, five days a week, you’re spending roughly 65 hours a year doing your makeup! Permanent makeup can save you a substantial amount of time each year, and it’s also a great alternative solution for people who cannot wear traditional makeup due to skin conditions and allergies. 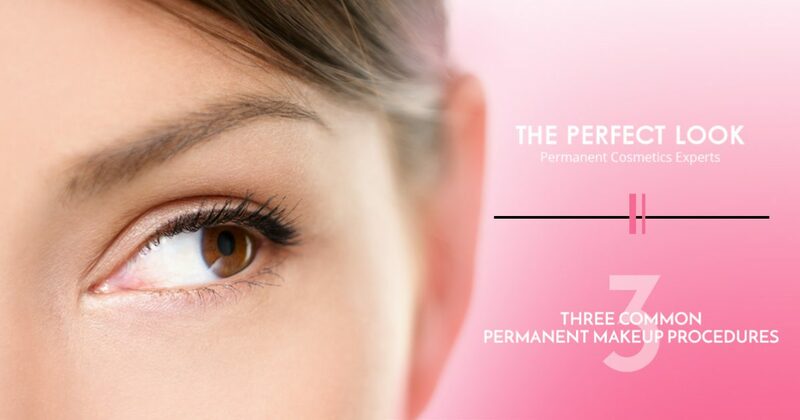 In today’s post, we’ll introduce you to three of the most popular permanent makeup procedures. If you’re interested in any of these permanent makeup procedures, or if you’d like to learn more, just call or email us to request more information! If you suffer from a condition such as alopecia, or if your eyebrows just aren’t as thick as you would like them to be, permanent eyebrows can be a great solution! One of the most common ways that permanent eyebrows are applied is through the use of microblading, which inserts fine lines of hair-like pigment into the skin. The resulting lines are nearly indistinguishable from normal eyebrows, and many patients regret not opting for permanent eyebrows sooner! The application is virtually painless when combined with a topical numbing cream. Are you tired of having to plan your day around your makeup? If you live in a humid climate or you go to the gym often, you’re probably used to carrying around extra makeup to use throughout the day. Permanent eyeliner is applied through the use of a tattoo machine, though the needle is much, much smaller than the needles typically used for regular tattoos. While permanent eyeliner application is commonly reported to be a bit more painful than permanent eyebrow application, numbing creams are available and the process is typically over in a short period of time. Much like the previous two permanent makeup procedures, permanent eyeshadow can help you save a substantial amount of time and money on eyeshadow. Permanent eyeshadow is applied using the same techniques as permanent eyeliner, though it’s reported to be less painful than a permanent eyeliner application. Whether you’re looking to add depth to your eyes with a light stade or you’re interested in adding a darker, bolder color to your eyes permanently, The Perfect Look’s permanent makeup artists are here to help! It’s important to note that while each of these procedures is similar to a regular tattoo in the sense that ink is being applied to the skin, permanent makeup will need to be touched up every few years. Your lifestyle and the climate you live in will play large roles in how often your permanent makeup needs to be touched up, and your permanent makeup artist can help you set reasonable expectations. We hope that you’ve enjoyed this introduction to permanent makeup. Stay tuned for future posts in which we’ll continue to explore other permanent makeup procedures. Are you ready to save time and money on makeup? Contact The Perfect Look in Austin today for more information!